Mosconi Billiard Table - Donovan II Model P5223W2 8-Foot Slatron Top. Table comes in three cartons: Slatron carton 100 lbs, Table frame carton 165 lbs, and Leg carton 75 lbs. 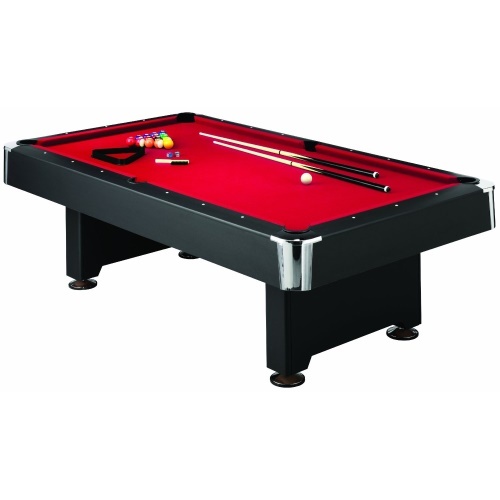 Free shipping for this pool table when shipped to the lower 48 United States. 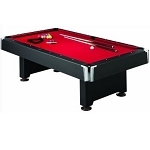 Billiard game tables comes with fast, free shipping. Donovan II 8-Feet. Billiard Table Black Laminate Top Rails with Full Profile K66 --provide uniform resistance for quality of play. Wool Blend Deep Red Cloth - allows for smooth, consistent roll. This is an excellent table for home use. It has the rubber edging and slate top that are very important and it comes with everything necessary to begin playing. We had it constructed by a friend who has experience and its perfect for our game room. Delivery was much faster than expected. I recommend it 100%. A: All of our products are brand new, straight from the factory. We try to be competitive in our pricing. If you receive a damaged shipment, then please contact us, and we will take care of it. A: There would not be a way to get different felt colors I'm sorry to say. These are brought in mass quantities from abroad. Dimensions: 98" x 33" x 23"